Twiddler's syndrome, first described by Bayliss in 1968, is a rare but potentially lethal complication of pacemaker treatment. In this syndrome there is painless dislodgment of device leads resulting from the patient's manipulation of the implanted device. The majority of patients with this condition are diagnosed within the first year of implant. In this report we present a patient who was diagnosed with Twiddler's syndrome within 48 hours of implantation of the permanent pacemaker. A 66-year-old post-CABG (coronary artery bypass grafting), nondiabetic, nonhypertensive, male patient with good left ventricular systolic function (ejection fraction 60%) was admitted with symptomatic intermittent complete heart block. Baseline electrocardiogram (ECG) revealed complete RBBB (right bundle branch block) with left axis deviation. A DDDR (dual chamber rate adaptive pacemaker) system was implanted in the right prepectoral area with a bipolar passive fixation ventricular lead and an active fixation bipolar screwing atrial lead at right atrial appendage. Measured ventricular lead R wave, threshold and lead impedance were 14 mV, 0.5 V, and 640 ohm, respectively. Atrial lead P wave, threshold, and lead impedance were 3.5 mV, 0.5 V, and 590 ohm, respectively. The implantation procedure was uneventful. Postoperative fluoroscopic images confirmed the satisfactory positioning of both the atrial and ventricular leads. An ECG also corroborated proper functioning of the DDDR system. 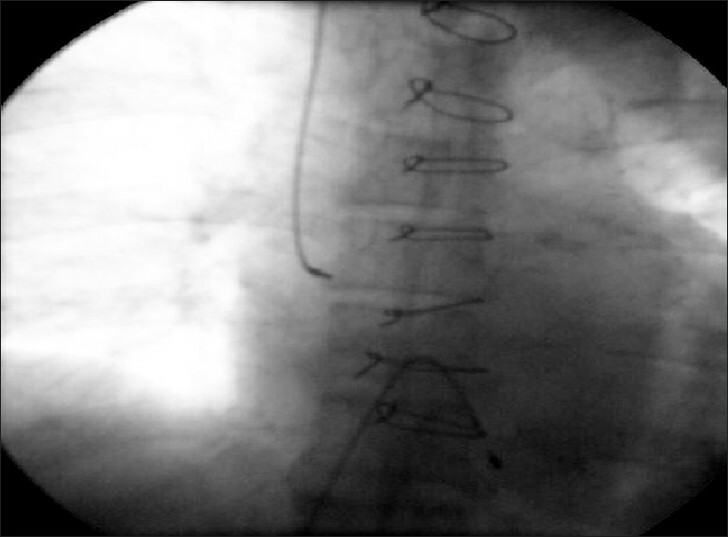 During the postoperative hospital stay, a routine chest skyagram on 2 nd day revealed dislodgment of ventricular lead. Pacemaker interrogation showed complete loss of pacing and sensing in ventricular lead with intact atrial lead function. The patient was immediately rushed to the pacing laboratory where a prophylactic temporary pacemaker was inserted. Fluoroscopy clearly showed the pulse-generator with twisted ventricular lead around it [Figure 1]. The atrial lead was seen to be in position but the initial loop was drastically reduced [Figure 2]. A diagnosis of pacemaker Twiddler's syndrome was made. The patient denied any manipulation of the pulse-generator. The pacemaker pocket was immediately reopened. The old ventricular lead was taken out. A new active fixation screwing ventricular lead was inserted. The old atrial lead was repositioned with an appropriate loop. Both the leads were found to have good sensing and pacing parameters. The pulse-generator was fixed on the pectoral muscle with nonabsorbable suture. Postoperative hospital stay was uneventful and the patient was doing well in subsequent follow-ups. Although the majority of cases occur during the first year of implantation, a "late Twiddler's syndrome" has also been reported. So far the earliest reported case is at 17 h.  Our patient was detected to have Twiddler's syndrome within 48 h of implantation. The majority, like our patient, deny any history of manipulation of the device. The presence of heavy dressing also probably precluded him from any manipulation, so other factors such as movement of the body may have some role in this peculiar syndrome. Minimizing the pocket size and suturing the device generally prevent the development of this syndrome. Some authorities have advocated the use of a Dacron patch, which stabilizes the pulse-generator by promoting tissue in-growth, in all cases of device implantation. Active fixations of leads are also encouraged. In our patient, there was no dislodgement of atrial screwing lead initially, and after active fixation of ventricular lead the situation did not recur in the subsequent follow-ups. Twiddler's syndrome is a rare complication of permanent pacemaker implantation with potential catastrophic consequences. Active fixation of device leads should always be performed to prevent this situation along with other preventive measures. 1. Bayliss CE, Beanlands DS, Baird RJ. 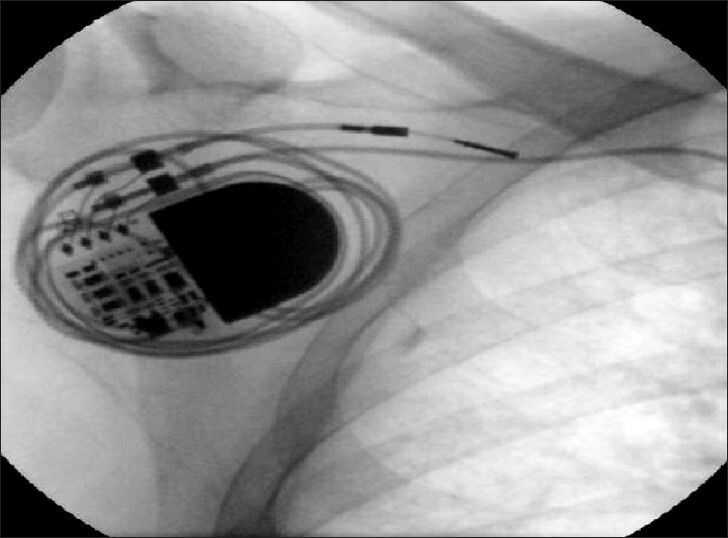 The pacemaker-Twiddler's syndrome: A new complication of implantable transvenous pacemakers. Can Med Assoc J 1968;99:371-3. 2. Sharif M, Inbar S, Neckels B, Shook H. Twiddling to the extreme: Development of Twiddler syndrome in an implanted cardioverter-defibrillator. J Invasive Cardiol 2005;17:195-6. 3. Fahraeus T, Hijer CJ. Early pacemaker Twiddler syndrome. Europace 2003;5:279-81. 4. Hill PE. Complications of permanent transvenous cardiac pacing: A 14-year review of all transvenous pacemakers inserted at one community hospital. Pacing Clin Electrophysiol 1987;10:564-70. 5. Gupta R, Lin E. Twiddler syndrome. J Emerg Med 2004;26:119-20. 6. Castilo R, Cavusoglu E. Twiddler's syndrome: An interesting cause of pacemaker failure. Cardiology 2006;105:119-21. 7. Nicholson WJ, Tuohy KA, Tilkemeier P. Twiddler's syndrome. N Engl J Med 2003;348:1726-7. 8. Dittrich J, Gartner U, Frese JH, Ran J, Rentsch I, Spaan G. Pacemaker Twiddler's syndrome. Med Klin 1979;74:1755-60. 9. Dursun I, Yesildag O, Soylu K, Yilmaz O, Yasar E, Meric M. Late pacemaker Twiddler syndrome. Clin Res Cardiol 2006;95:547-9. 10. Furman S. Defibrillator Twiddler's syndrome. Ann Thorac Surg 1995;59:544-51.